We’ve increased the amount of items you can borrow. SGUL students/staff and NHS staff are now able to borrow up 15 items at one time. Some exceptions do apply*. We’ve increased the amount of renewals on your loans. Items on your record will now be automatically renewed until the end of your course. Loans for NHS and SGUL staff will be automatically renewed until their Library account expires. This means you won’t have to remember to renew the items yourself, or bring them back to the Library when they have reached their renewal limit. However, items won’t successfully renew if another user requests them, or you have accumulated more than £10 in fines. You’ll be notified by email if your book has been requested by another user. We’ve changed the way we charge overdue fines. By introducing these rolling renewals, we hope our users will accumulate fewer overdue fines over the course of their studies. However, if a book is recalled, you’ll be charged 20p per day until the book is returned. We’ll also continue to issue invoices for non-returned, lost or damaged items, which cover the cost of a replacement plus an additional administration charge. By increasing the amount of books you can borrow and extending your renewals, we hope that borrowing books from the library becomes a more flexible experience for the majority of users. However, rolling renewals will mean that books are likely to be off the shelves for longer periods if they aren’t requested by other users. Therefore it will become more important for users to request books that are on loan by placing a hold (or reservation). If you’ve not placed a hold before, see our FAQs below for further instructions. How can I check when my books are due? You can manage your account by signing sign in to Hunter using the login option in the top right-hand corner (or by clicking the ‘My Account’ link on the library homepage). How do I place a hold on a book I need? Click on this link and you’ll then be asked to confirm your request. Step-by-Step instructions for placing a hold can be found here. Don’t forget, you can manage your holds by signing-in to your account in Hunter. If you no longer need a particular title, please do be courteous and cancel your request so it becomes available for another user. I’m going on placement – what if someone requests the book I’ve borrowed? If you know you are going to be away for St George’s for some time, we’d usually recommend using an electronic version of the book you intend to borrow to avoid picking up fines on physical items you are unable to return. However, using an electronic version isn’t always possible. While it’s likely that the rolling automatic renewals will last the duration of your placement, if someone has placed a hold on your item it will still need to be returned by the due date. Otherwise you’ll be charged 20p per day until the book is returned. If your book has been reserved but you are unable to return it, please sign-in to your Library account on Hunter and attempt to renew it manually by clicking the ‘Renew’ button next to the correct item in your ‘Loans’ section. By doing this, if another copy of the book is returned, your renewal will be successful. You may need to attempt this over a few days to allow enough time for another user to return their copy. I have outstanding fines on my account – do I need to pay them? Yes – although fines are changing, you will still need to pay any outstanding fines on your account. Try to pay them as promptly as possible: once your fines reach £10.00 your books won’t automatically renew and you won’t be able to borrow further items. If you have any further questions about these changes, please send them to the User Services team by emailing library@sgul.ac.uk or ask a member of staff at the Library Helpdesk. *Exceptions include: honorary members of staff, elective students & placement students. Some NHS job categories are only eligible for restricted loans or reference only access. On Friday 9th and Monday 12th February 2017, all overdue fines* paid at the Library Helpdesk (between 8am – 6pm) will be donated to SGSU’s RAG week. So come along to the Library, pay your fines and do your bit for charity! *Excludes invoice payments for lost or damaged library stock. St George’s Library is supporting RAG week – Mon 13 & Fri 17 Feb fines will be donated to charity. On Monday 13 February and Friday 17 February 2017, all overdue fines* paid at the Library Helpdesk (8am – 6pm) will be donated to SGSU’s RAG week. On Monday 22 February, all overdue fines* paid at the Library Helpdesk (8am – 6pm) will be donated to SGSU’s RAG week. So come along and pay your fines and do your bit for charity! Pay your overdue fines* at the Library Helpdesk on Friday 15 November and we will donate the total to the BBC’s Children in Need campaign. Overdue books? Outstanding fines? 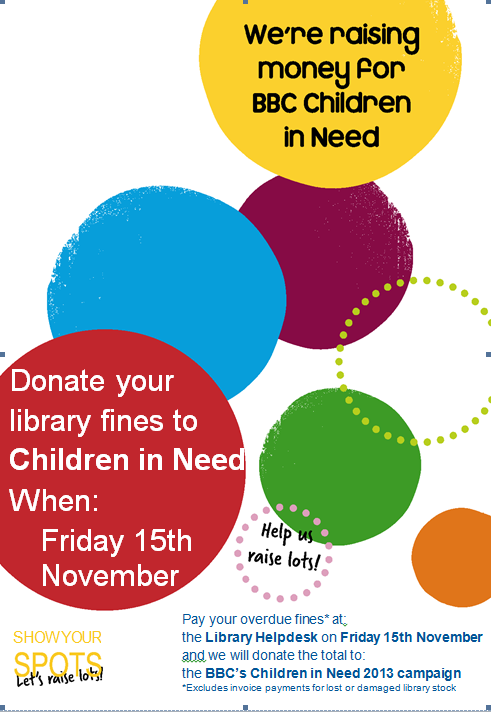 This Friday, the 20th November, all overdue fines paid to the Library will be donated to the BBC Children in Need appeal. Why don’t you pop in and clear your card for a worthy cause? Last year we donated over £500 – we would like to beat that target this year.